On Easter Sunday, the last day of March, my wife and I decided to go for a Sunday drive. The weather was nice and I wanted to see some crows before April rolled around. We were not disappointed. We saw three of them feeding alongside Highway 35 just north of the TransCanada (Yellowhead). We then drove east on the Yellowhead to the Margo Grid where we turned north. 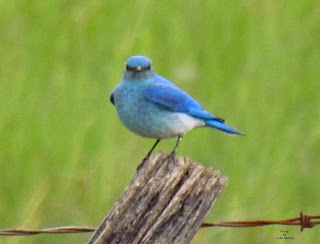 As we drove alongside the community pasture we came across a small flock of approximately eight Mountain Bluebirds. Bright sky blue bluebirds against a backdrop of white snow is a pretty sight to say the least. Although I had my camera with me I was not able to get a picture of them. In past articles I have been a little remiss in not mentioning bluebirds as one of our earliest spring arrivals that get here about the same time as the crows. 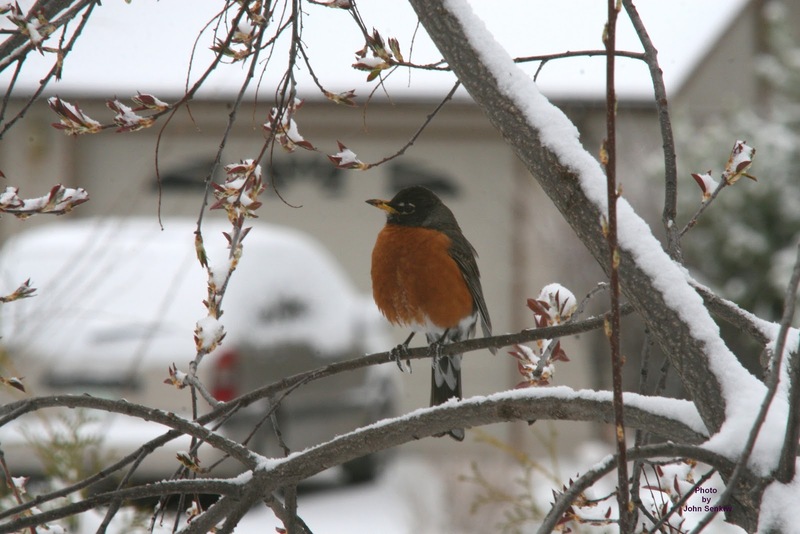 Because bluebirds are more rural and less conspicuous than crows they are not seen as often and, therefore, not associated with the approaching spring the same way crows are. There are three species of bluebirds in Canada: the Eastern, Western and Mountain. The Eastern and Western Bluebirds are very similar but, fortunately in Canada, their ranges do not overlap so identification is not a big problem. The males of both species are a bright blue with rusty breasts and whitish bellies. The one distinctive field mark is that the rust on the Eastern Bluebird extends upward to the throat and the chin; the rust on the Western Bluebird stops abruptly at the top of the breast. In short the Western looks as if it had its entire head dipped in bright blue paint. In Canada the Western is a bird of the western slope of the Rocky Mountains while the Eastern ranges from the Atlantic roughly to the Manitoba/Saskatchewan border and south along the American border to the Cypress Hills. The male Mountain Bluebird is a bright sky blue with no other colours at all. The breast and belly are a lighter shade of blue but still very blue. 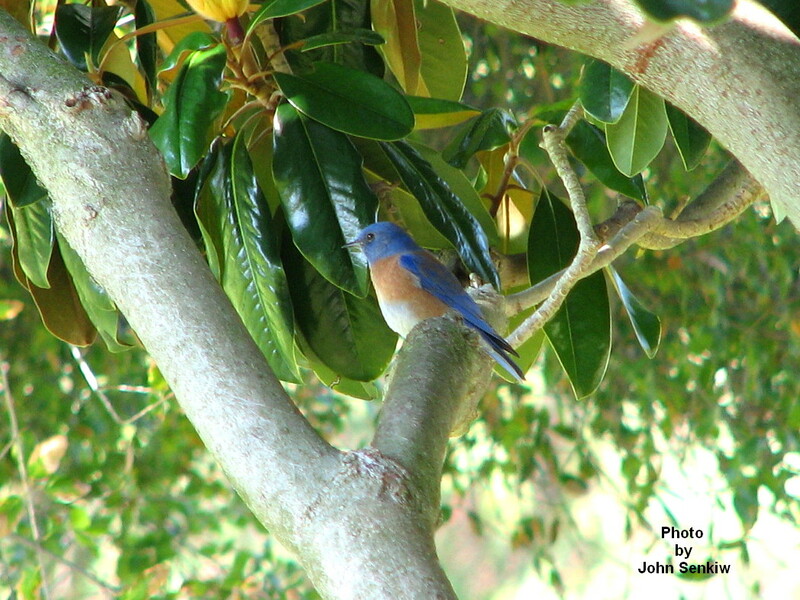 Of the three species of bluebirds the Mountain Bluebird is the one truly "blue" bird. 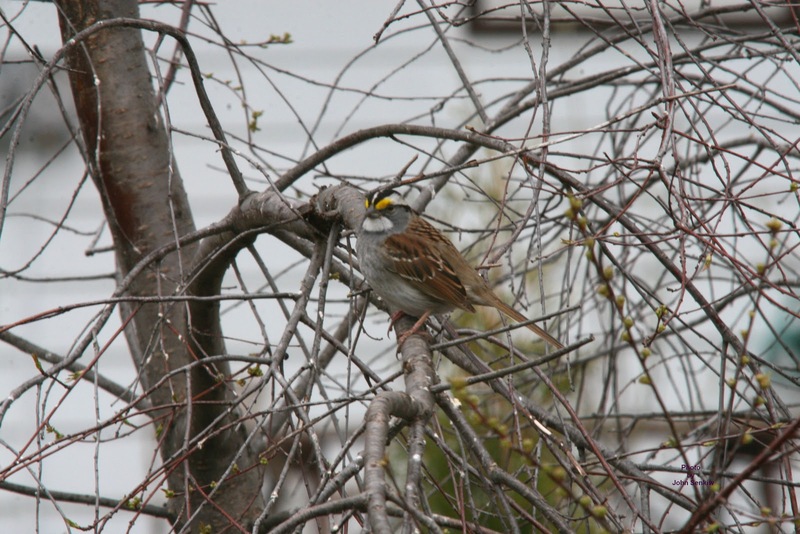 The females of all three species are a pale greyish brown with just a hint of blue. In Canada the Western and Eastern Bluebirds are separated geographically and the Mountain is quite different from the other two so that identification is never a problem. In the winter the situation is different as all three can be found in western Texas and eastern New Mexico so identification can be difficult - especially among the females. The three have different songs and call notes that can be used for identification. Bluebirds are cavity nesters and this preference just about brought about their demise. Before Europeans arrived in the Americas woodpeckers created enough cavities for the bluebirds and their competitors such as wrens, Tree Swallows and Purple Martins. With the introduction of the very aggressive House Sparrows and Starlings the availability of cavities for the bluebirds was reduced dramatically and the bluebird populations plummeted. At this point some concerned bird lovers decided to intervene by building and setting out thousands of birdhouses along thousands of kilometres of roadways. It was discovered that birdhouses that were placed out in the open away from trees were avoided by both the House Sparrows and Starlings but readily accepted by Tree Swallows and bluebirds. The result was that the bluebird population has rebounded but a constant supply of birdhouses is needed to replace the older decaying ones. Anybody travelling to Saskatoon on the Yellowhead can see some of these birdhouses along the road by the Wolverine Siding and west toward Plunkett. 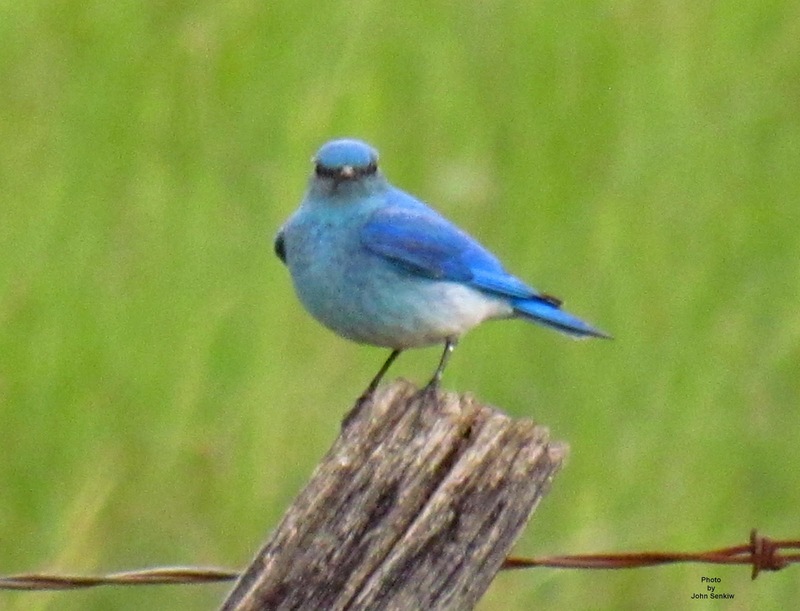 This week's photos are of a male Western Bluebird and a male Mountain Bluebird. The picture of the Western was taken near San Diego, CA while the Mountain was taken along the Dunlop Road east of Foam Lake. Although I have seen Eastern Bluebirds I have never gotten a picture of one. Hopefully soon.